Liporidex MAX is a fat burner diet pill that claims to work by increasing energy and metabolism through several highly potent stimulants such as caffeine, green coffee, bitter orange, and guarana. But does the amount of stimulants heighten the amount of weight loss? And at what cost to the consumer? Our team of nutrition research enthusiasts are constantly scanning the diet supplement terrain for new and exciting products to review, rating them according to a three part criteria of 1) what’s the science backing the product, 2) is the product’s company legitimate, and 3) what are the customers saying? So with all of this in mind, let’s take a closer look at Liporidex MAX. 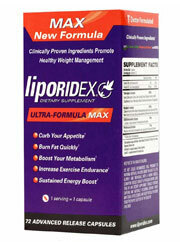 Liporidex MAX is manufactured by Nuretix Research Labs LLC, a company based out of San Diego, California. In addition to Liporidex MAX the company also manufactures Liporidex Plus and Liporidex PM. It seems the main difference between all three is the amount of stimulants contained in each one. Liporidex MAX has the highest amount whereas Liporidex plus has fewer and Liporidex PM - as its title would suggest - is stimulant free and suitable for taking before going to bed. The company website looks good, offering up all the necessary contact information including address, phone number, and a “contact us” portal - all of which scores high points with our team for quality of website. So how does the product itself bode? So according to the advertising for Liporidex Max, this product makes many of the same promises as other diet pills: boost metabolism, energy, and focus, in addition to cutting down on hunger cravings. But does it do what it says? Well if one thing’s for certain, Liporidex MAX has more than enough stimulants. The product contains a 326 milligram “proprietary blend” containing green coffee bean extract, raspberry ketones, green tea extract, evodiamine, and higenamine, a secondary proprietary blend of 183 milligrams of caffeine, guarana, bitter orange extract, bacopa, bioperine, a third proprietary blend of 113 milligrams of choline, phenylethylamine, L-tyrosine, vinpocetine, and a fourth 85 milligram proprietary blend of rhodiola extract, quercetin, ashwagandha root, and vitamin B6 and B12. Therefore, altogether this product contains 707 milligrams of a proprietary blend, meaning nearly a thousand milligrams of ingredients of which the proportions are not disclosed! Additionally, although Liporidex MAX incorporates a very professional approach to its website’s appearance - trading in the bikini-clad girls for sharp looking conservatively dressed men and women - there is hardly any medical, scientific, or clinical trials backing any of these ingredients, and mainly customers say they describe feeling energized while on Liporidex MAX but some reported vomiting and being unable to get to bed at night. Although Liporidex MAX comes from a solid-looking website and offers a money back guarantee, there are just too many blank spaces to properly understand this product. For one, no specific amount of each ingredient is disclosed (courtesy of several proprietary blends) and this means it is impossible for us to know whether each ingredient is being over utilized or under utilized! However, one thing that is for certain: Liporidex MAX is loaded with stimulants - in fact, a multitude of the ingredients in this product are stuffed with caffeine and the consumer should be prepared for side effects such as jitteriness, anxiety, insomnia, palpitations, headaches, and dehydration. Altogether, our team cannot recommend this product due to its lack of ingredient amounts, unproven weight loss ingredients, and heavy reliance on stimulants for fat burn. In our opinion the consumer would be better served choosing a product with far less stimulants and quality fiber (instead of just more stimulants) to control hunger. Bottom Line: Liporidex MAX comes from a legit company but over-relies on stimulants, which may lead to many unwanted side effects and not enough actual, healthy weight loss.